If my daughters are going to be anything like their mummy, then they are going to need lots of shoes!!! Infact my 3 eldest are already taking over the wardrobe space the amount they have. Layla however is yet to really start her collection. So when I was sent a pair of Daisy Roots shoes to review I couldn't help but get a little excited. These lovely little shoes are made from a Chrome Free Tanned Leather which is great for the environment as well as for your little ones feet. One thing that really makes them stand out for me is that they are made in the UK. I love being able to support businesses in our country, they have gone from strength to strength as these popular shoes are now sold not only across the UK but in the USA, Europe and Asia as well. I was asked to choose which design I would like, now I have to say this was a very tough choice. Daisy Roots provide designs for boys and girls, all the designs called out to me and with 100 girls shoes to choose from, I wish I could of had one of each. I finally decided on a pink pair with silver footprints embroidered on them, unbelievably cute. Most of their shoes are available in sizes 0-6 months up to 18-24 month but they also provide a good range of larger size shoes going up to 3-4 years. 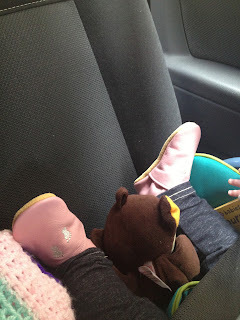 When they arrived I couldn't wait to get them on Layla's little toes. The leather is very soft, making them easy to put on but because there is elastication at the top, your little one can't kick them off, meaning no more lost shoes!!! We were actually on our way out when they came so here is Layla in her car seat looking all posh with her shiney new shoes. The leather being chrome free means you don't have to worry about your child putting the shoes in their mouth, this is certainly handy as Layla is at the stage where everything ends up in her mouth. And the suede anti-slip soles make them perfect for when your little ones start cruising around the furniture. I have to admit I chose the shoes in 6-12 month because Layla is 8 months old but they have come up quite big, however I think Layla has tiny feet bless her, just means plenty of room to grow in to them. I wouldn't hesitate to recommend these to my friends and family. Most of the shoes are priced at £18.50 and I think for the quality that you get, this price is very reasonable. For just £2 extra they offer to gift wrap them for you, making a great present for any child. I have had lots of people comment on how cute they are, I'm already trying to decide which pair to buy next. Why not take a look at their website and tell me which shoes you would pick. You can also find Daisy Roots on Facebook for all of their latest news and lovely designs.